The event commemorates the formation of the United Nations’ Food and Agriculture Organization (FAO) which was first established on the 16th of October 1945 in Quebec, Canada. 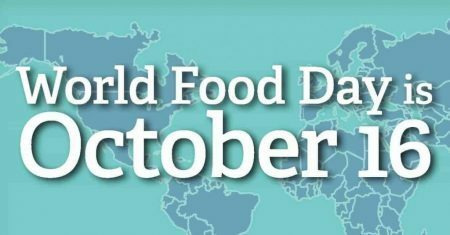 World Food Day has been celebrated by millions of people in almost every single country around the world since its inception in 1979. Active supporters gather together to raise awareness about the dangers of hunger and how it will affect many people’s lives in the years to come if we do not do something to put a stop to it. Every human being on the planet has the right to be free from hunger and the right to have sufficient food on their plates – three times a day – every day. The vast majority of those gravely affected by hunger are people living in poor countries. 805 million people, one in nine worldwide, live with chronic hunger and 60% of the people around the world who are hungry are women. Every year, almost 5 million children aged 5 and below die of causes related to malnutrition and 4 in 10 children coming from severely deprived countries are malnourished, which has damaged their bodies and brains. Each and every one of us can take part in this event. Not only will we able to contribute to the fight against hunger, we can also apply all the experiences and lessons we gain and learn from WFD in our daily living. Search for events and activities in your local community, town or country and pick one or more events or activities that you can participate in. You can attend conferences, seminars and exhibitions held by government agencies, charities, schools, universities and other organizations about hunger. You can also take part in fundraising activities for the eradication of hunger. Additionally, there are some organizations that prepare food packages to be delivered to areas in your town or even in other countries where food is very scarce. Give at least an hour or two of your time to help people prepare these food packages. Nobody in this world deserves to live a life of hunger. When people do not eat, they become extremely unhealthy. Hungry people have trouble learning things, struggle with making themselves more productive each day, are frequently ill and have low life expectancy. Hunger is something that must not be neglected and it can happen to virtually anyone, anywhere – even in the richest countries. Bringing an end to hunger not only saves lives, it can help society as a whole.